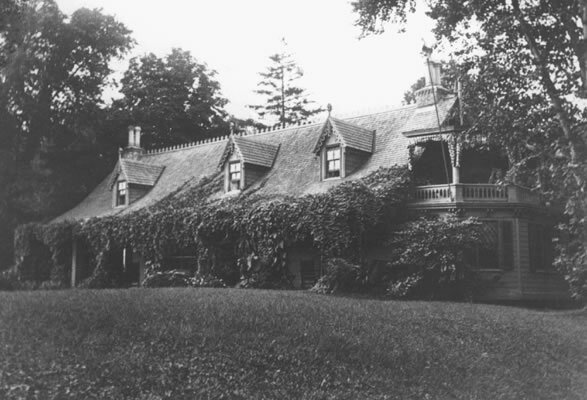 When photographer Alice Austen (1866-1952) lived there, Staten Island was a quiet, bucolic, upper-middle-class suburb of picturesque “cottages.” The Austen family home, Clear Comfort, was a 17th-century Dutch farmhouse purchased by Austen’s grandfather in 1844 and renovated and added on to over the years. When Austen’s father abandoned them, she and her mother came to live at Clear Comfort, where Alice was surrounded by a family of supportive relatives, including an uncle who presented her with her first camera when she was 10 years old. One of the country’s earliest female photographers, Austen was also the first woman to take her camera into the streets of New York City, producing an invaluable record of life at the turn of the 20th century. Her earliest documentary photographs predate those of Alfred Stieglitz and Edward Steichen, whose work is now renowned while that of the gifted Austen, who died in obscurity, is largely forgotten. Austen frequently focused her camera on the upper-class world she knew best, recording what she referred to as “the larky life” – tennis matches, bicycling, swimming, amateur theatrics, auto races. But her subjects also included the poor of lower Manhattan – street vendors, immigrants in Battery Park, shoeshine boys, ragpickers – who were far removed from her comfortable life. Austen took photographs almost every day, at a time when cameras and photographic equipment were heavy and bulky and glass plates cost about two dollars each. During her lifetime, she produced about 9,000 photographs, and the extant glass plates and negatives are today part of the collection of the Staten Island Historical Society. Austen’s home is a National Historic Landmark. The first floor is open to the public, but only one room, the downstairs parlor, looks much as it would have in Alice’s time. As her finances dwindled after the Crash of 1929, Austen began selling furniture and art objects to New York museums, and some of these have been retrieved for exhibit at Clear Comfort. Fortunately, Austen, for posterity, left a complete record of both the interior and the exterior of the house, which made the restoration process much easier.